Admiral's Tavern is located on Cruiser Olympia at Independence Seaport Museum. 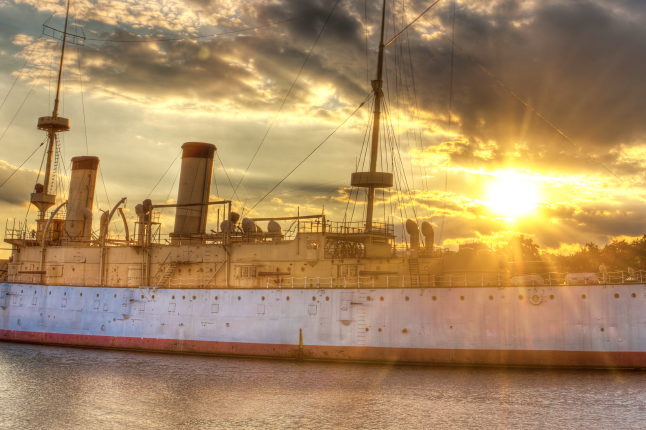 Start counting down the days until you can get tipsy aboard a historic warship. Independence Seaport Museum announced that its pop-up beer garden on Cruiser Olympia will return this summer for a second season. The beer garden, called Admiral's Tavern, will open Memorial Day weekend. You can hop aboard the ship Thursday, May 24 through Sunday, May 27. After, the beer garden will be open only Fridays and Saturdays, from 6 to 11 p.m.
Local breweries will be highlighted each week, and in addition to beer, there will be wine, cocktails, food, games and entertainment.